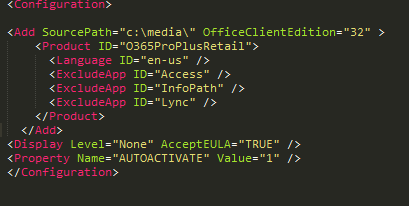 With the latest release (June 5) of Office Deployment Tool there is the ability to exclude applications when creating a package. For example, if you don’t want to deploy – say Lync? – even though you are technically licensed for it. 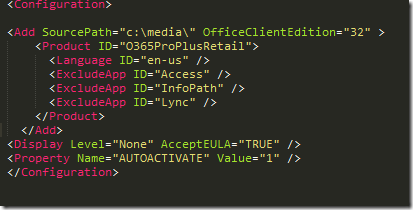 The XML defines what product you want to deploy / create an App-V package for. Now you have a package! Read more about this on Technet! Great article. We are working through an App-V 5 deployment of office right now, and this helps a lot. Have you been able to change the package GUID with the newly supported PACKAGEGUID flag? We want to deploy for example Project as standalone, and Visio as standalone, and would want to obviously change the package GUID, but the flag isn’t working for us. Curious to know if it does anything for you. I have never had issues with me beeing presented with a EULA prompt. I am using the latest ODT and did exactly as you have described above, but everything is included in the App-V package. I have to set the applications to enable=false in the deployment config file for the applications I do not want. Has anyone gotten this to work?